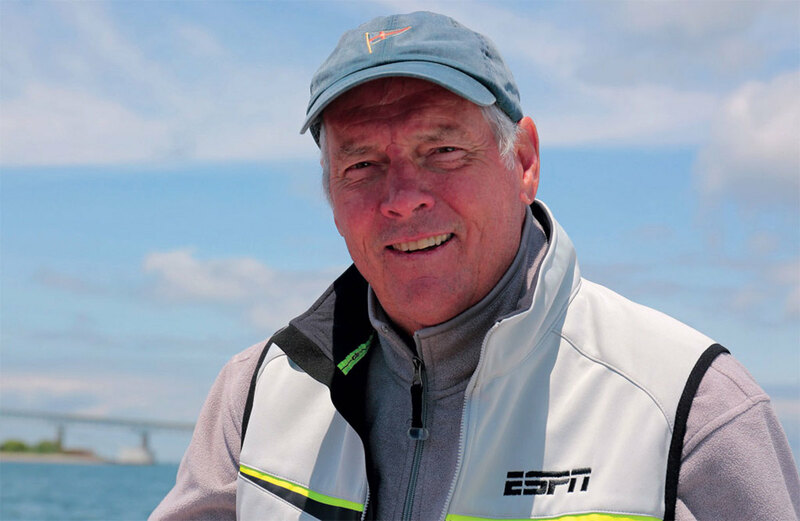 Gary Jobson is an America’s Cup-winning sailor and one of the most vocal—and opinionated—supporters of the sport. His story is an inspiration to sailors young and old alike. How did you know you wanted to make a career in sailing? The defining moment was when I was 12. I got a little dinghy called a Penguin. Family came over and were thinking of getting into sailing, and I was this 12-year-old explaining what sailing was and giving them lessons. At that moment, I thought, gee, I could get people enthused about sailing. I’ve been on that mission ever since. It’s rare to turn a passion into a career—how did you do it? In the late ‘60s and early ‘70s, it was very uncool to be a professional sailor. People didn’t get paid to race. It was kind of dirty. So the only way I could make a living was to talk about it, write about it, do seminars and clinics. I didn’t get paid to race, but I made my money by doing all this and I became a sailing coach. But that got interrupted by Ted Turner. You don’t just meet Ted Turner! Ted is 12 years older than me. He came up to [Robbie Doyle and me after a collegiate regatta] and said, “I don’t know who you guys are, but someday we’re gonna sail together.” Oh, OK.
Ted made an interesting deal with me. He said, “Look. You don’t know this, but you’re gonna help me sail better, and we’re gonna win a lot of races. And in return, I’ll help you with your business career.” And he has always been there. If I called him up right now, he’d pick up the phone, and we’ll talk. What does it feel like to sail in the America’s Cup? Ted and I always did these ritual walks, and one day, two days before the start in ‘77, Ted said to me, “You know, no matter what we do in the rest of our lives, nothing will be as cool as this right now.” And he was right. Your first big break as a commentator for ESPN came during the ’87 Cup. I got to sail with Jimmy Buffett then. When he was down there, we sailed together and he wrote a song [“Takin’ it Back”] which we put on ESPN. He wrote it during the event, specifically for that Cup. He didn’t even know the outcome at the time. It was really cool! You were a big supporter of Matt Rutherford on his return from his Solo the America’s voyage. Matt’s a great study and a great story. I mean, on the one hand, he’s totally whacked, and on the other hand, he’s brilliant. The audacity to say, ‘I’m going to sail this little boat around the Americas.’ You’ve got to think, are you crazy? But the real story of Matt is just his internal drive to achieve a goal and to prove to himself more than anybody else that he can do it. And I think that anybody that has had some kind of adversity can learn from Matt that you can overcome it. How do you view creativity? When you’re truly creative, not everything goes perfectly. I haven’t seen the perfect sailboat race yet. And sometimes in the races you lose, you learn far more than the races you won. What distinguishes racing sailors from cruising sailors? Often I think racing sailors lose sight of why they’re out there. A cruising sailor probably has a little better sense of connecting with nature, of spending time with people. But even the cruising sailor should sail the boat efficiently because it’s more comfortable and you get to a place faster. The most important thing, either way, is to set goals. What was it like watching the last Cup front and center? The intriguing thing about the 34th America’s Cup in 2013 was not the boats, it was the comeback, a very compelling story. And lucky us that we had the television up and running and organized, and the pictures were clear on the onboard cameras and the sound off the boats and the exciting graphics. We had really brought the whole thing to life. Very cool. If you were Larry Ellison, what would the 35th America’s Cup look like? Bermuda is a wonderful place, but it’s not the United States. And the Deed of Gift was written as a perpetual challenge cup for friendly competition between foreign countries. You need to put all American crew on the American boat. And all Swedish crew on the Swedish boat. And all New Zealand crew on the New Zealand boat. If you do that one thing, the interest level will go through the roof. And on the boats, if you wanted to have a real test, I’d get rid of the computers [that calculate lay lines], I’d get rid of all [hydraulic] stored energy and let the sailors make the difference. Larry Ellison also needs to be part of it so people can relate [to him]. That’s what was so intriguing about Harold Vanderbilt or Ted Turner or Dennis Connor. They were available. Some people liked Ted, some people didn’t. But he was there and we got to know him. We didn’t get to know Larry Ellison. Anything you want to recommend? When you’re on a boat, spend time talking to people. You really get to know people in a much more open, free way. And if you really want to learn something, talk to successful people and ask them questions. Learn to ask good questions of people that have done cool things. You’ll find that they love answering. Don’t talk about yourself. Ask about others. That’s kind of what I’ve tried to do.